Here's a Value Stream Mapping video example from the fictional "Naples Sailboat Company." You may remember the previous video I posted where they introduced kanban using simple plastic sailboats. In this video, the process is outlined with a current state Value Stream Map. Using sticky notes and a whiteboard is an interesting method for value stream mapping. I guess you can move things around easier when you create your future state map. I prefer good old paper, since I get to keep a physical record of the map when we're done. The video is a good example of how to walk through a process, highlighting where inventory is stored and how the information flows. I like seeing before and after videos. Instead of just highlighting a problem, they usually give you a solution as well. In this case, we get to see an improved value stream map. 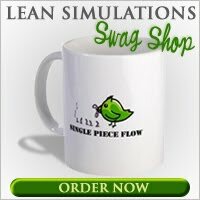 If you liked these videos, make sure you check out my huge compilation of lean videos.